On my quest to find the perfect shade of turquoise eyeliner, I narrowed the field down to two opponents. Essence's Tu-Tu-Turquoise is the cheaper of the two (retails for $2.95 AUS) and in an ocean of blue, Tu-Tu-Turqoise hovers at the top. Application was easy -- the colour appeared almost immediately with a glimmer of sparkle. This formula stays as promised, however, fallout occurs during application; be prepared to clean up a few flecks of colour before walking out the door. Savvy by DB (retails for $6.99 AUS) is a deeper and darker turquoise shade, it's more like the deep end of the ocean. Application was just as simple, yet took a little longer. The pencil needed to be warmed in order to get the colour party started. As with Tu-Tu-Turquoise, Savvy by DB's Turquoise also requires clean up. 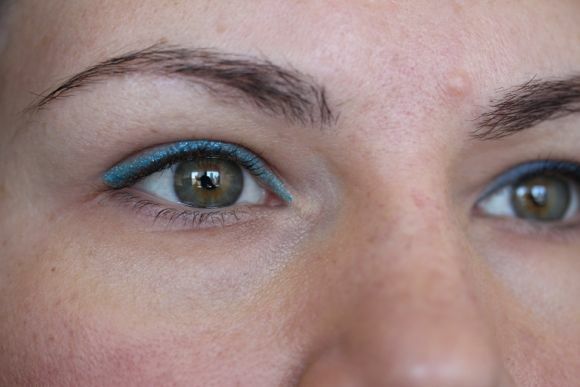 Don't worry about a dance party in your crease either, once applied Turquoise falls in line. Which turquoise pencil came out swinging? Points go to Essence for affordability and availability; it's also my personal favourite. For a more sophisticated turquoise eye, Savvy by DB is the pencil for you; Australian ladies can find this shade at their local Priceline. For the International set, Stila's Peacock appears to be a close, albeit more expensive, dupe.